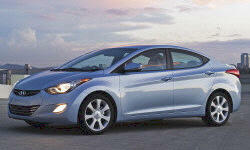 Hyundai Elantra Pros and Cons | Page 1 of 4 | Why Not This Car? What drives people to buy (or not buy) a certain car? TrueDelta's members share Hyundai Elantra pros and cons based on their real-world driving experiences. Great value in a solid urban commuter. In a field of its peers, not much stands out. Drove the Hybrid version. Since the battery takes up a large space in the back, they deleted the spare, and give you a spray can of goop, and a 12volt air compressor. It has plenty of trunk and passenger space, and the newest safety technology and gadgetry. Would easily hold four and 4 large bags for an airport run. Good gas mileage, being a hybrid. Worked hard but not a fan. Will probably avoid Hyundai after this. I have coworkers with older cars in poorer condition that repair less frequently than I do. Great family car serving us well. It proved to be a solid buy. Refer to myu CON section then make up your own mind to buy. I have owned this car for almost eight years. It still handles very well in any type of weather. I feel that is is a very dependable car. When you compare the base features and options that Hyundai offers to that of a Mazda or Honda the Hyundai vehicle is better equipped. For this reason alone I selected a Hyundai product over a Mazda which I have owned three in the past fifteen years. Cons mentioned in review. None of the issues listed would prevent me from buying another Elantra. My honest review of the 2012 Elantra. This is my review of the 2012 Elantra, we previously owned a 2011 and 'upgraded'. Overall I love my car, but there are a couple of things I wish had been done differently. Owned for 7 years and 63,000 miles. After the first 10K miles, the AVERAGE MPG has risen from the low 20's to the high 20's on my average commute, but is nowhere near the advertised efficiencies. NOT a happy camper with this! I found the electric steering on the Elantra to provide much better response and control. Impressed with fuel mileage, and I'm getting better than touted. Couldn't do that with the last car, unless I could find pure gas (no ethanol). With the Elantra I'm getting 40 mpg mixed driving with ethanol. steering is numb and handling is unpredictable. The dash and audio system including XM radio. Very sleek & sporty, many people have commented on the styling. Mostly good comments.